Have you ever had a row with your lover, or partner, that has left you feeling weak or sick for days? The kind of argument that echoes in your head so long you don’t know which way to turn? Very few of us have escaped the pain that a rift within relationships can cause. Of course we may fall out with friends, or family, and experience differences of opinion with work colleagues which can leave us feeling miserable… but the greatest pain and deepest wounds seem to be caused by the bitter arguments and emotional battering we experience within our closest ‘loving’ relationships. Not only from the very serious, such as divorce, but continuing bickering over domestic issues causes problems. Many lovely people are carrying the scars of a failed or toxic relationship. Sometimes the pain is fresh and raw, but in many cases the rift still hurts after decades. It is so important to be able to heal our emotional wounds before they become too deep. Evidence shows that the cells within our amazing human body have a memory of their own and will hold the pain in certain areas, particularly the joints or heart and chest area. This weakens us, often to the point of debilitating physical discomfort and chronic ‘dis-ease’. So how can the angels help us with this human condition? 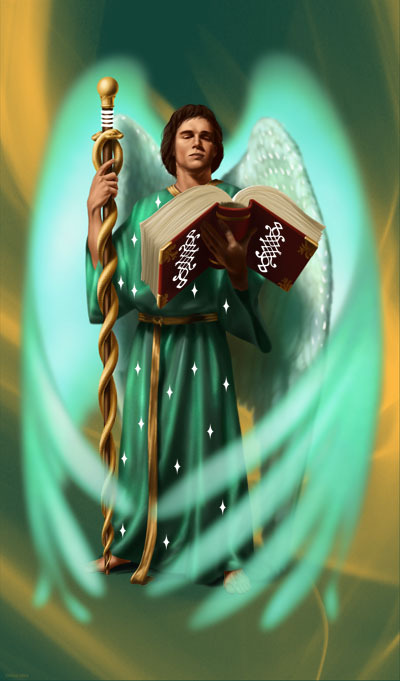 It could be said that all our guardian angels bring love, compassion, and healing, but when it comes to specific issues it is good to develop a regular communication with one of the great Archangels and learn to attune to the powerful energy carried by these beneficent beings. Archangel Raphael is known as the great healer. In fact the name means “God has healed” or “the shining one who heals”; rapha in Hebrew means “healer” or ‘doctor”. Raphael helps with all issues of wholeness, healing, vision, and scientific discovery. He also assists with overcoming degeneration, superstition, error and blockages in abundance. Not only does he help in overcoming disease but also healing on a psychological and spiritual level such as with deep emotional wounds caused by personal relationships. So, if you would like angelic help with this particular issue here are three ways of working with Archangel Raphael for healing your emotional wounds, and also dealing with the overall challenging situation. You can spend as long or as short a time on these exercises as you please. The more you practice them, the greater the effect. Imagine a beautiful green light surrounding you and filling your body with peaceful healing light. Ask the powerful energy of Archangel Raphael to cleanse away any toxic thoughts and memories that are causing you pain. Imagine the green light calming your mind as you breathe it in for a few moments, balancing your energies and repairing your cells. Say this affirmation to your self as often as you like in sets of three: “Every cell in my being works in perfect harmony”. Call Archangel Raphael three times and ask that his energy surround you for this exercise. Picture the person, or partner (with whom you have the issue) as happy and well. Now picture in your mind’s eye a whole circle of angels surrounding that person. With Archangel Raphael by your side you enter the circle and stand facing your partner. In this safe and sacred space say to your partner: “I truly forgive you for any pain you have caused me. … And I ask you to forgive me too for any pain I might have also caused you.” Thank Archangel Raphael and the angels of healing for their assistance, knowing that this powerful exercise has already begun to take effect and that it will create the best possible outcome for all concerned. There are three elements to compassion, and these are love, kindness and patience. It is often easier to be loving, kind and patient with someone else but can be very difficult to have these qualities for our self. Archangel Raphael wants us to heal with compassion, by reminding us how unique, beautiful and loved we really are. Remember that the angels see only the light within us, and the more we treat others and ourselves with tender loving care the brighter we shine. When we have compassion for ourselves, we can also feel the same for even those who hurt us. Close your eyes for a moment and imagine you can see a tiny light forming behind your eyes. Watch as it gets brighter and brighter reminding yourself that this is your inner Divine light. Give this little light your love and admiration, just as you would any other thing of great beauty and value. Now imagine the other person in this situation, with a beautiful light shining from within. Say in your head (or out loud if no-one is listening): “The Divine light within me acknowledges and loves the Divine light within you”. This way you can have compassion for the Divine light within for you and your partner without actually focusing on any negativity within the situation.